LATEST JOB UPDATE : Recruitment on 9031 Vacancies in UP Panchayati Raj Department can be done through Outsourcing. Technical Assistants in MGNREGA can not be adjusted with Panchayat Sahayak Post. Read Full News from Image below………. Good News !! 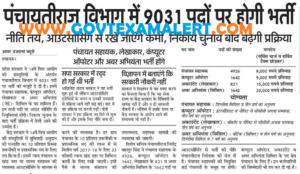 UP Panchayatiraj Department will make Recruitment on 9031 Various Posts. Check Details of Vacancies, Qualification, Salary, How to Apply for UP Panchayati Raj Recruitment 2017 Details below…..
Age Limit : For UP Panchayati Raj Recruitment 2017, Age Limit can vary Post wise. Maximum Age Limit can be 40 Years. 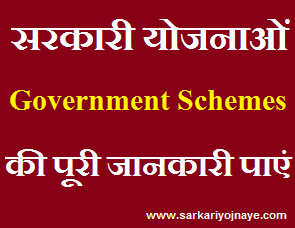 Panchayat Sahayak : Diploma in Civil Engineering & have 3 years work experience. Computer Operator : Candidate must have passed 12th & have CCC Certificate from NIELIT. Candidate also have 3 years work experience. Accountant : Candidate must have passed B.Com & have CCC Certificate from NIELIT. Candidate also have 3 years work experience. How to Apply : Recruitment for Various Posts mentioned above will be done from outsourcing. Candidates need to have regular watch on UP Panchayati Raj Department’s website (http://panchayatiraj.up.nic.in/). It is better for candidates to have their Work Experience Certificate along with them. Job Aspirants need to have a regular watch on UP Panchayati Raj Department website & also have regular watch on Local News Paper. UP Panchayati Raj Recruitment 2017-2018 Latest News Updates will also available on www.govtexamalert.com. So Bookmark this Page (Press CTRL+D) & get regular UP Recruitment News Updates. You can leave your query regarding UP Panchayati Raj Recruitment 2019 in the Comment Box. We will try to be responsive. Leave an email at Disha@govtexamalert.com for Assistance. Hi Rajesh, you can get latest railway job update from given link..